http://thebaglab.com/product/litter-bag-wcoupon/?add_to_wishlist=502 official statement Sadly our prediction that more and more Airbus A320 family aircraft, which includes the A319 and A321 which are simply slightly smaller and larger versions respectively, will crash in unexplained circumstances has once again come true. A Metrojet flight from Sharm el-Sheikh towards St Petersburg crashed 23 minutes after take off. Airbus says aircraft that crashed in Egypt was A321-200. Initial reports blame a ‘technical problem’ but no further details have yet emerged. Following on from the Germanwings incident in the Alps not long ago we predicted we would see more and more of this type of incident. In our opinion, the probable cause of these crashes is explosions in the equipment fitted to them used in the ongoing Climate Engineering programs carried out by virtually all major passenger airlines around the world that use these aircraft. These systems are highly pressurised and the payload extremely heavy. The one thing you really don’t want on a passenger flight is a heavy pressurised system, and when we consider that these systems were originally fitted about 10-15 years ago on the older models, then what we are probably seeing is the equipment coming to the end of its reliable working life. It would be interesting to look at the registration numbers of these aircraft to see how old they are and whether there is any correlation to age. Airbus said the A321-200 that crashed in Egypt was 18 years old, had made almost 21,000 flights and accrued about 56,000 flight hours. It had been operated by the Russian airline since 2012. Even if a link cannot be established with other similar incidents, we are utterly convinced that explosions in the cargo hold can explain all of them all. Unfortunately as this is a Russian operator and the crash was in Africa, reliable information will be very thin on the ground and we wont be able to get access to any reports on the crash, but we are pretty sure the usual inconsistencies and cover ups will appear soon enough. We know Russia to be as involved in Climate Engineering programs as other countries as we monitored Russian carriers picking up chemical cargo on the Gulf of Guinea along with all the others, so it is reasonable to assume their A320s are fitted with the same systems and are spraying the same chemicals. The recent incident in Las Vegas gave us an incredible chance to see one of these incidents unfolding before our very eyes. Fortunately it occurred just before the aircraft was airborne so no lives were lost, and as a result it revealed the true nature of what is occurring. Boeings and Airbus have very similar systems and they differ only in the number of pipes that are used to spray the chemicals. Boeings have only a single pipe emanating from the pylon and are used only to spray the tiny plastic fibres which produce the haze and Induced Cumulus clouds we see. Airbus have 3 pipe systems and can spray a number of different chemicals, possibly including the haze, but mostly we see them producing the persistent spreading trails which turn into expansive thin cloud cover. Interestingly we also found this film. 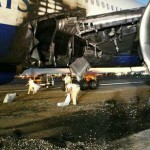 It describes the cause of the 1985 737 fire as a loud thud in the lower part of the aircraft, followed by a severe fire. Does this sound familiar at all? That is exactly what happened in Las Vegas. Both the Airbus and Boeing systems are fed by chemical storage tanks loaded onto the aircraft inside ULDs – Unit Load Devices (above). This can be seen taking place airside at any home airport – by this we mean where the particular airline is based. Until the Las Vegas incident we has thought that Airbus systems were loaded and located in the front cargo hold and the Boeings in the rear. This was derived from surveillance of Ryan Air and several other Boeing at various international airports. They always seemed to load the luggage at the front, and never the rear, which is the opposite of the Airbus A320s. The Las Vegas incident clearly showed a massive chemical fire coming from the front hold though, so we are holding judgement on the Boeing for the moment until we can conduct more surveillance to establish if the ULDs are loaded at the front or the rear. The internal layout of the Boeing 737 series of aircraft may allow for rear loading but positioning at the front. We just don’t know at this stage but please contact us if you can shed any light on that. Few people are probably aware that there was yet another incident involving yet another Airbus A320 at Manchester Airport on September 17th. Despite being a near catastrophic incident little was made of it in the press. 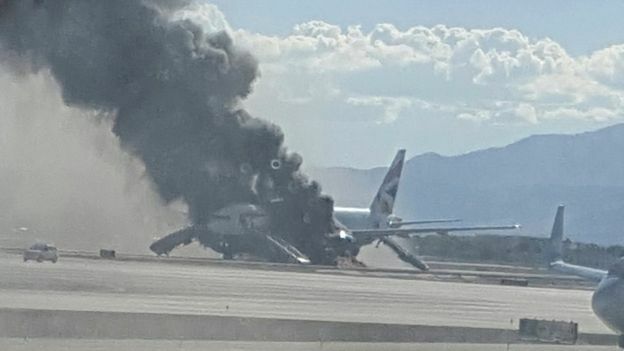 Once again a bird strike was cited as the cause but the many reports from passengers and those on the ground described extremely loud banging or popping, with flames and sparks coming from one of the engines. 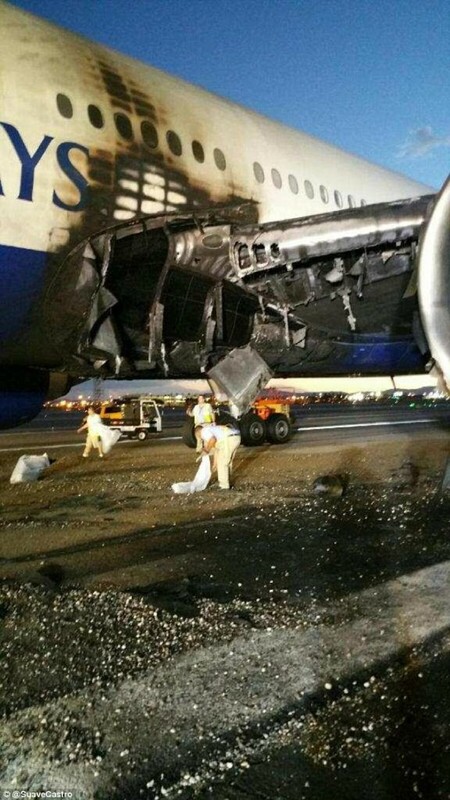 Generally speaking engines do not catch fire with bird strikes and even if they do, automatic systems are engaged that shut down the engine and put out the fire so this does not seem to fit with what happened. 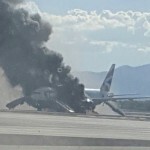 This short film on Youtube, shows good footage and it certainly does look like the engine is ‘backfiring’ and there is no evidence to suggest a fire in the hold, which is why we did not report on it at the time, but alarm bells must surely be sounding in many people’s minds about the safety of flying now in light of the greatly increasing frequency of similar crashes and near fatal incidents that all seem to happen in unusual circumstances. We also have another theory that we posited as far back as 2013. It is possible that the plastic fibres are collecting in some way inside the engines. This would explain the older engines having trouble. In incidents where where engines fail but no explosion or cargo hold fire can be established, this might be a plausible explanation. certainly we know that when plastic burns it leaves residue which cant be good for such high-performance combustion engines. Even the newer Turbofan engines still need to combust a mixture of fuel and air, so if the air is saturated with plastic fibres then they will inevitably affect performance and possible pose a safety risk. It would also be interesting to look at the servicing procedures and frequency to establish if there has been any change in the last 20 years, and if so what and why. We may update this article if more information comes in. Daily Mail latest info and timeline here.